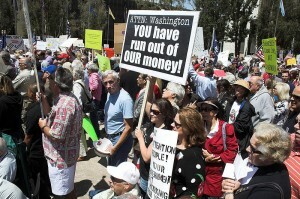 The middle class has quite a gift welcoming them as the calendar flips over to 2013. Their payroll taxes are going to go up, their income taxes are going to go up, and approximately 28 million households are going to be hit with a huge, unexpected AMT tax bill on their 2012 earnings. So happy New Year middle class! You are about to be ripped to shreds. In addition to the tax increases that I just mentioned, approximately two million unemployed Americans will instantly lose their extended unemployment benefits when 2013 begins, and new Obamacare tax hikes which will cost American taxpayers about a trillion dollars over the next decade will start to go into effect. If Congress is not able to come to some sort of a deal, all middle class families in America will be sending thousands more dollars to Uncle Sam next year than they were previously. And considering the fact that the middle class is already steadily shrinkingand that the U.S. economy is already in an advanced state of decline, that is not good news. You would think that both major political parties would want to do something to keep the middle class from being hit with this kind of tax sledgehammer. Unfortunately, at this point it appears that our "leaders" in Washington D.C. are incapable of getting anything done. So get ready for much smaller paychecks and much larger tax bills. What is coming is not going to be pleasant. Weren't the tax increases only supposed to be for the wealthy? Well, that is what the politicians always promise, but it is always the middle class that ends up getting hit the hardest. In this day and age, the big corporations and the ultra-wealthy are absolute masters at avoiding taxes. For example, Facebook paid approximately $4.64 million in taxes on their entire foreign profits of $1.344 billion for 2011. That comes out to a tax rate of about 0.3 percent. Overall, the global elite have approximately 18 trillion dollarsparked in offshore tax havens such as the Cayman Islands. Keep in mind that U.S. GDP for 2011 was only slightly above 15 trillion dollars. So the global elite have an amount of money parked in offshore banks that is substantially larger than the total value of all goods and services produced in the United States each year. According to one estimate, a third of all the wealth in the entire world is stationed in offshore banks. Our politicians are playing checkers and the global elite are playing chess when it comes to taxes. Our current system of taxation is irreversibly broken and should be entirely thrown out and replaced with something else. And of course under our current system those that are poor don't pay much in taxes because they are just trying to survive. So who always ends up getting the painful end of the hammer? The middle class does, and that really stinks. In a cruel epilogue to 2012, roughly 28 million families would owe the IRS $86 billion more than they anticipated for this year should the country plunge off the cliff, according to the nonpartisan Tax Policy Center. Those families would face the "Alternative Minimum Tax," which was introduced in 1969 to supposedly guarantee that wealthy Americans could not elude the taxman. But the AMT not only flopped, it was never indexed to inflation. So with each passing year, it seeps away from high society and into the wallets of Target and Wal-Mart shoppers. That sets up a disaster for April 15. On the whole, 98 percent of those with incomes between $200,000 to $500,000 would pay an additional $11,000 in AMT this year, according to the center's estimates. About 88 percent of those with incomes of $100,000 to $200,000 would need to fork over another $3100, and even the majority of Americans with earnings between $75,000 and $100,000 would have an AMT liability. Most of the tax increases that will be coming as a result of the fiscal cliff will be for 2013 earnings, but the AMT tax hike will apply to 2012 earnings. So if you end up falling under the AMT, you better get ready to write a very large check to Uncle Sam in just a couple of months. And the AMT is only just one of the very painful tax increases that American families will be facing. If no deal is reached in Congress, every single middle class American taxpayer will be dealing with significantly higher taxes. So why don't our politicians do something about all of this? What are they fighting so bitterly about anyway? Sadly, neither side is actually serious about substantially reducing the size of government deficits or about getting government spending under control. During a recent interview on CNBC, Ron Paul explained that "they pretend they are fighting up there, but they really aren't. They are arguing over power, spin, who looks good, who looks bad; all trying to preserve the system where they can spend what they want, take care of their friends and print money when they need it." Most in the mainstream media are making it sound like some kind of a "battle royal" is going on in Washington, but as Lou Dobbs recently pointed out, the U.S. national debt is going to end up in just about the same place no matter what happens. According to Dobbs, if we "do nothing" the U.S. national debt will be approximately 25.8 trillion dollars in 2022. If "Obama wins", the U.S. national debt will be approximately 25.4 trillion dollars in 2022. If "Boehner wins", the U.S. national debt will be approximately 25.2 trillion dollars in 2022. So they are putting all of us through all of this torture even though nothing will really change in the long run no matter who wins? What kind of a circus is this? Meanwhile, the reckless spending continues. Barack Obama has just issued a new executive order that ends the pay freeze for federal workers that had been in place. So now all federal employees will be getting a nice hefty pay raise. For example, Vice President Joe Biden brought in $225,521 this year. Next year, he will make $231,900. US Secretary of State Hillary Clinton has been admitted to a New York hospital with a blood clot caused by a concussion she sustained earlier this month. "In the course of a follow-up exam today, Secretary Clinton's doctors discovered a blood clot had formed, stemming from the concussion she sustained several weeks ago,” State Department spokesman Philippe Reines said in a statement on Sunday. Reines added that the secretary of state was being treated with anti-coagulants at New York-Presbyterian Hospital, where she is expected to remain for the next 48 hours so doctors can monitor her condition. "Her doctors will continue to assess her condition, including other issues associated with her concussion. They will determine if any further action is required," the spokesman pointed out. Reines, however, did not specify where the clot was discovered. After returning from Europe earlier this month, Clinton, 65, fell ill with a stomach virus which led to her fainting and sustaining the concussion. Clinton will step down from her post as the the secretary of state before US President Barack Obama officially begins his second term in January. Vice president Nicolas Maduro tells Venezuelan people the president's health is delicate following cancer operation. Hugo Chavez has suffered "new complications" following his cancer surgery in Cuba, his vice president said, describing the Venezuelan leader's condition as delicate. Vice president Nicolas Maduro delivered a solemn televised address from Havana, saying he had spoken with Chávez and that the president sent greetings to his homeland. Maduro did not give details about the complications, which he said came amid a respiratory infection. "Several minutes ago we were with president Chávez. We greeted each other and he himself referred to these complications," Maduro said, reading from a prepared statement. Maduro was seated alongside Chávez's eldest daughter, Rosa, and son-in-law Jorge Arreaza, as well as attorney-general Cilia Flores. The vice president's comments suggest an increasingly difficult fight for the ailing president. The Venezuelan leader has not been seen or heard from since undergoing his fourth cancer-related surgery on 11 December, and government officials have said he might not return in time for his scheduled 10 January inauguration for a new six-year term. "The president gave us precise instructions so that, after finishing the visit, we would tell the (Venezuelan) people about his current health condition," Maduro said. "President Chávez's state of health continues to be delicate, with complications that are being attended to, in a process not without risks." Maduro held up a copy of a newspaper confirming that his message was recorded on Sunday. 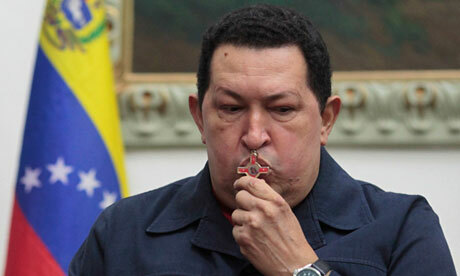 "Thanks to his physical and spiritual strength, Comandante Chávez is facing this difficult situation," Maduro said. Maduro said he had met various times with Chávez's medical team and relatives. He said he would remain in Havana "for the coming hours" but didn't specify how long. Maduro, who arrived in Havana on Saturday for a sudden and unexpected trip, is the highest ranking Venezuelan official to visit Chávez since the surgery. Before Chávez left for Cuba, he acknowledged risks in the operation and designated Maduro as his successor, telling supporters they should vote for the vice president if a new presidential election was necessary. Chávez said his cancer had come back despite previous surgeries, chemotherapy and radiation treatment. He has been fighting an undisclosed type of pelvic cancer since June 2011. Maduro's latest update differed markedly from last Monday, when he had said he received a phone call from the president and that Chávez was up and walking. The vice president spoke on Sunday below a picture of 19th century independence hero Simon Bolivar, the inspiration of Chávez's leftist Bolivarian Revolution movement. Maduro expressed faith that Chávez's "immense will to live and the care of the best medical specialists will help our president successfully fight this new battle." He concluded his message saying: "Long live Chávez." Potentially fatal bird flu viruses can spread on the wind, a hitherto suspected but unproven route of transmission. Usually, people catch bird flu through close physical contact with each otheror, much more commonly, with infected poultry. The newly identified capacity for wind to spread it opens up a potential route by which the viruses can spread between farms. The finding came about after Dutch researchers studied an outbreak of the avian flu strain H7N7 in poultry on Dutch farms in 2003, which resulted in 89 confirmed human infections including one death. Computer models showed that wind patterns at the time of the outbreak explain how different genetic variants of H7N7 ended up on different farms (Journal of Infectious Diseases, doi.org/j3b). 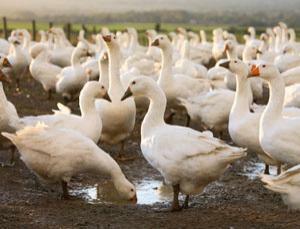 H5N1 is the most harmful strain of avian flu, having killed 360 of 610 infected people since it was discovered in 2003. The fact that a related strain can travel on the wind suggests that H5N1 can too, says Marion Koopmans of the Dutch National Institute for Public Health and the Environment in Bilthoven, who coordinated the research project. "You must assume that this same potential is there for H5N1," she says. Other researchers agreed that by implication, H5N1 could spread in the same way. "Because we don't know, we should assume the worst case – and the worst case is that H5N1 travels on the wind as well," says John McCauley, a bird flu researcher at the MRC National Institute for Medical Research in London. He says it's well known that the virus that causes foot and mouth disease in cattle and pigs travels many kilometres on the wind, but it's lighter than avian flu and is produced in huge amounts by infected animals. McCauley says the most likely scenario for bird flu is that the virus hitches a ride on airborne particles from farms, especially particles of infected faeces from poultry farms.